I have said this many times before but chocolate and peanut butter is my favourite combination. I really don't understand people who do not like it. No judgement (well maybe a little) but only because you are seriously missing out! 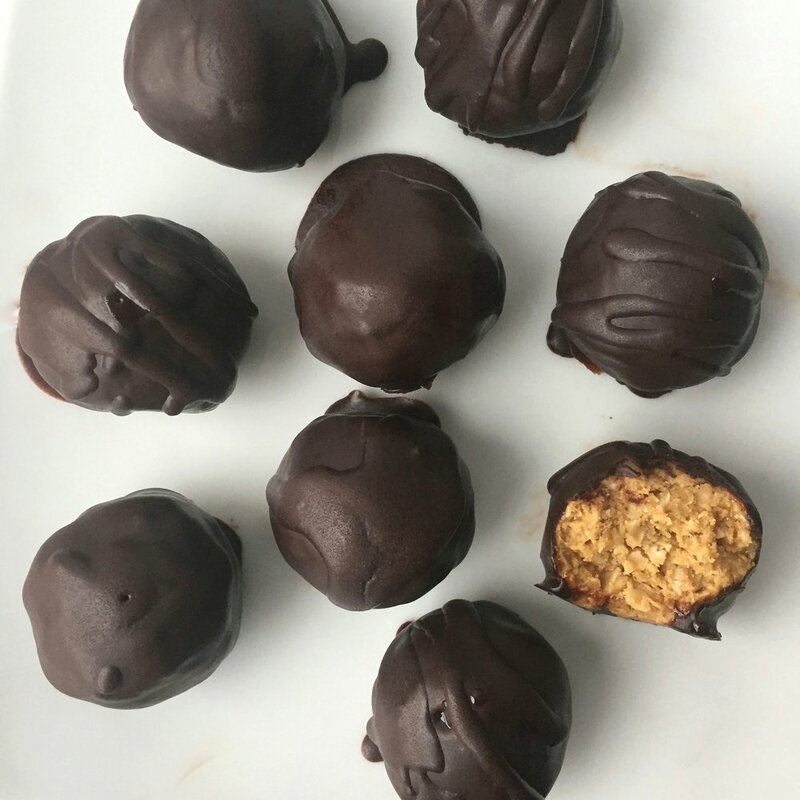 Peanut butter balls were one of my favourite holiday treats growing up but they were usually made with excess butter, icing sugar and Kraft peanut butter (which is basically more sugar). They were (and still are delicious) but I decided to "healthify" this treat with no refined sugars, natural peanut butter and a dark chocolate coating. Enjoy! In a bowl combine oats, peanut butter and 1 tablespoon of maple syrup. Stir well until combined. Form into 12 - 1 inch balls and set balls on a cookie sheet lined with parchment paper until chocolate is ready. In a small saucepan on low heat, melt coconut oil and stir in cocoa and maple syrup until smooth. Using a spoon, gently roll ball around in the chocolate until well covered, using a fork gently allow excess chocolate to drip off and place ball back on the cookie sheet. Continue with all balls. Place cookie sheet in the refrigerator until chocolate has hardened, about 20 minutes. Store in refrigerator or freezer until serving to avoid the chocolate acting from melting. Note: You can also make the chocolate coating by melted dark chocolate versus making it but I love the slight coconut flavour the coconut oil provides.